US based art historian Monica Bowen is author of Alberti's Window, one of the most beloved of art history blogs. Like all great writing, Monica's style is one which lends itself to appreciation by a wide audience. Her talent for effortlessly drawing a reader into the material is refreshing, particularly given the verbose nature of the study of art history! I thought a lot about connoisseurship, wondering if I would be able to tell Caravaggio's hand apart from the reconstruction, without the help of a black light. Even though connoisseurship is rather looked-down upon in art history, there really is a lot of value to it. The question of connoisseurship and its role in art history is one that fascinates me personally. In the advent of scientific methods being used to verify attributions, there seems to be a gulf between traditional connoisseurship and scientific methods used. As an external observer, I would have imagined that the two modes of thought should work together, but I have found that opinions are quite divided! I mention it as an apt example of Monica's ability to get to the pertinent facts, which she constantly does in a charming and highly readable way. 3PP: As a professional art historian and educator, what led you to start your own blog? MB: I actually started my blog when I was finishing up graduate school. At first, I just wrote down basic experiences and memories with works of art. However, after graduation I quickly realized that blogging was a great way for me to continue research. Like many art historians, I went through a period of unemployment after graduation. During those months when I was searching for a job, my blog helped me not only to keep on top of the discipline, but also allowed me to teach and discuss art with others. Now that I have a teaching position, I still use my blog for research. Sometimes I even use posts as a teaching tool for my students. I like to let students know that I blog about art history; I want them to realize that the art historical discipline is dynamic - there are always new ideas being presented, even for works of art that are hundreds of years old. In Forgers,copyists and authenticity/authority, Monica gives us the fascinating and oft omitted facts about beloved masterpieces such as the copy of van Eyck's Ghent Altarpiece section, Just Judges. 3PP: In one of your posts at David Packwood's Art History Today, I read how you were constantly thinking about how to present new art experiences in your blog. I think this is a diagnostic sign of a passionate blogger! Has writing for your blog become a part of your personal experiences with art, or do you view it more in the sense of a means of sharing knowledge? MB: I am passionate about blogging! I like to write about personal experiences with art, though I have realized that many of those experiences (particularly aesthetic reactions) don't translate as well when expressed through the blogging medium. Although I still share some of those experiences on my blog at times, I have found that it's hard to recreate the same experience when one is limited to showing image reproductions on a computer screen. (I often feel limited when trying to describe such experiences in the classroom as well, and often end up saying, "You just have to see this work of art in person!") So, in the end, I usually view my blog as a means of sharing knowledge and generating discussion on a topic. 3PP: As an external observer, I get a sense of some art historians having difficulty adjusting to the medium of the web as a means of delivering content. Does this explain why there are so relatively few art history bloggers? MB: Yes, I do think that art historians are having trouble with delivering content through the web. It seems like art historians are starting to embrace technology, but slowly. I feel like we are finally getting to the point where we have embraced the web to find research material, but it isn't because we are publishing online: instead, art historians often publish through a traditional print method that eventually winds up online. I think art historians need to move toward publishing directly on the web, and I think that blogging is one of the ways that can happen. I hope that more art history bloggers will pop up in the coming years. 3PP: Your writing style is very accessible to professionals and amateurs alike. When setting the tone of a piece, do you have a particular audience in mind? MB: I have a few friends and family members who like to read my blog but don't have much of a background in art. When writing, I often think about how I can formulate my post so that they can understand the topic. Although I realize that some of my posts are directed towards art historians, for the most part I try to write in an approachable way. 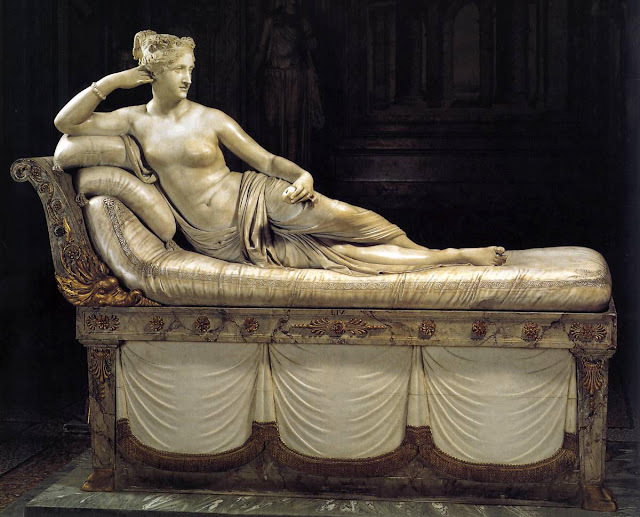 Canova's Paulina Borghese as Venus(1808). 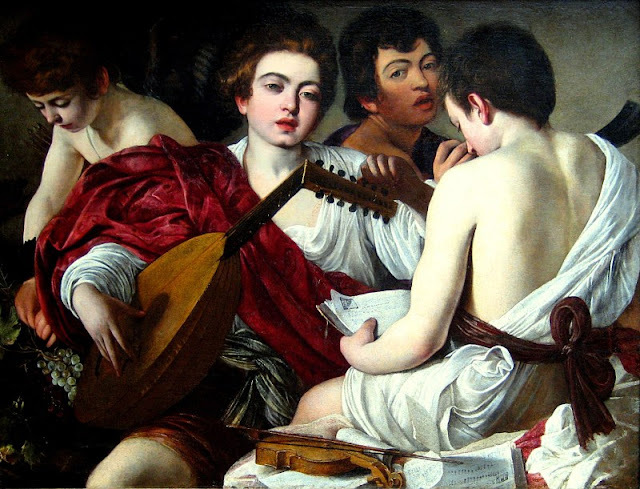 Monica's article, The cyclical nature of art looks at the broad scope of art across millennia. 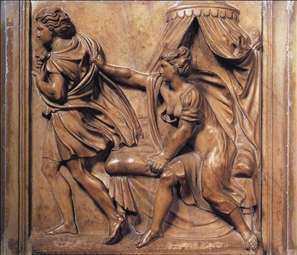 She describes sculptor Antonio Canova as the inheritor of traditions established by artisans from antiquity to the Renaissance and beyond. 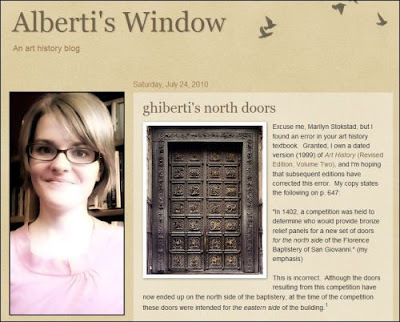 3PP: Can you briefly describe what Alberti's Window is, and why you chose it as the title of your blog? MB: The Renaissance theorist Leon Battista Alberti wrote that paintings should be a "window on the world." Basically, Alberti was arguing that painting should be illusionistic. 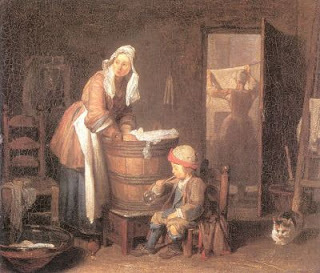 When looking at a (framed) painting, the viewer should feel like they are looking outside a window frame at a an actual scene (i.e. the illusionistic effects make the scene seem real and plausible). I thought this would be a fun title for a blog for two reasons: 1) a blog page is framed by a rectangular computer screen, similar to how paintings are framed and 2) I hope that my blog can serve as a "window on the [art] world," and give people access to some insights and discussion on art. UK directorPeter Greenaway has a strong art history influence in all of his work. In his astounding period piece, The Draughtsman's Contract, a device known as an 'Alberti's Perspectival Window' is omnipresent, symbolising the way the lecherous draughtsman Mr. Neville perceives the aristocracy he is employed by. The concept of a window of perception has evolved from Alberti's original description of the practicalities of composition. This evolution was famously explored in Anne Friedberg's landmark work, The Virtual Window: From Alberti to Microsoft. 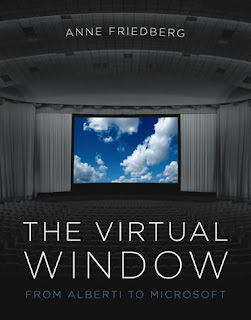 An interactive online demonstration of the concepts covered in the book is available at thevirtualwindow.net. 3PP: Are you an artist yourself - do you like to draw, paint, sculpt? MB: No, I'm not an artist - but I wish that I was! I've dabbled a little with sketching and painting, but I'm too self-critical to really enjoy the process. After studying the art of talented people for several years, I am extremely critical of my own artistic attempts. I did take an art class (for art historians) when I was an undergrad, which was geared to help art historians understand the different types of artistic mediums. I enjoyed the class a lot, but it was my last serious attempt at making art. 3PP: What are some of the challenges faced by art history as a field of study and a profession? MB: As a profession, unemployment is a huge problem for art historians. There aren't enough art history jobs to go around, and a lot of PhD holders are not able to find a position within museums and universities. I love to encourage students to study art history, but I want them to also be realistic in their expectations for working in the field. I also feel like one of the challenges facing art history is the tension between the "old" and "new" ways to study art. Art historians from the "old" tradition tend to focus on social history and formal analysis for their discussion of art, whereas "new" art historians are interested in more theory and visual culture. I have also noticed that most "new" art historians don't focus on prehistoric or classical subject matter, which has caused the discipline to be unbalanced in terms of approach. Personally, though, I think that this challenge might resolve itself within the next few years. Many of the traditional art historians are from a previous generation and are at the point of retirement, and the rising group of art historians may gain control of the art historical reins. In the recent article, What if sculptures were painted? 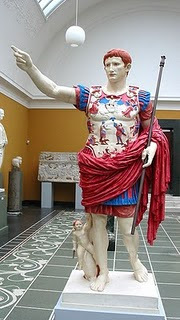 (August 2010), Monica confronts modern preconceptions about classical sculpture, relating it to the growing body of evidence on the nature of colours used to decorate famous works such as the Augustus of Prima Porta, above. 3PP: What drew you to formally study art history? MB: My first art history class was in high school. I remember being really excited about how art history encompassed so many other disciplines and facets of academia: philosophy, music, psychoanalysis, literature, theory, etc. It was appealing to know that I could study art, while at the same time learn about a hundred other things. Monica's post on the depiction of Washer women(May 2009) in painting is wonderfully related, having been inspired by a dream in which she hurriedly needs to prepare a lecture on washer women! 3PP: Can you describe a memorable experience beholding the work of a Renaissance master? MB: I distinctly remember seeing Leonardo da Vinci's The Virgin of the Rocks at the Louvre a few years ago. I was struck by the gracefulness and clever composition of the painting, as well as the use of color and sfumato. I know that I particularly enjoyed having such an intimate moment with this painting because I just had passed through a horde of tourists who were crowded around the Mona Lisa. I kept thinking to myself, if people would just walk around the corner from the Mona Lisa display, they would be able to see another Leonardo painting (and in my opinion, a more striking one than the Mona Lisa) in a much more intimate, personal, and up-close way. 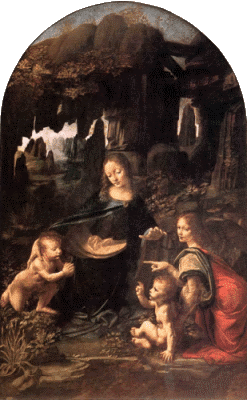 The Louvre version of The Virgin of The Rocks. There is also a version in London painted c.1508. 3PP: What lies in the future for art history in an online context? MB: As a blogger, I would like to say that art history blogs will become more prevalent. I think that this trend is starting, particularly because many major art museums have begun to host blogs. I also hope that more discourse is generated through such blogs - at this point, I feel like more discussion could take place. Blogging is a great way for people to share ideas, give thoughtful suggestions, and combine areas of expertise. Since art historians are no longer limited by geographic boundaries through the Internet, I would hope that online art history conferences and forums also become available, so that scholars can collaborate more easily. This is great! You have some fun visual additions, like the numbers and blog/portrait picture. I've never seen "The Draughtman's Contract" before, and I liked the inclusion of that clip. Once again, thanks for all of your work and for inviting me to participate in Art&History@Web. cheers M! I'm pleased you liked it. Make sure you watch The Draughtsman's Contract if you get the chance, as well as the more recent Greenaway movie about Rembrandt, called Nightwatching(2007) I will do a Greenaway feature one day in the not too distant future! I have a question: what do you think a world-class doctoral program for art history will look like in the 21st century? Cheers Heidenkind! That is also a perfect question for my next interviewee who like Monica also works in education. I wonder what Monica herself thinks? My 2c: art history education has to embrace new mediums and science. I think it has as much to do with making art history a viable career choice as well as enabling the field to integrate the staggering amount of new media that needs to be catalogued in the same manner as painting or sculpture....video games, CGI, digital art. I am always staggered when I hear or read how some AH educators have barely tried powerpoint presentations, let alone something wonderful and interactive like Monica is doing with her blog. The future of a profession in the humanities is something I will be asking all my interviewees. I'm looking forward to seeing what variation there will be in the responses received! Congratulations to both you and Monica on a really good interview. some scholars may shudder at the thought of blogging but I agree that it is the wave of the future for Art History. By the way, I'm glad to see that you are a Kurosawa fan. Are you familiar with Dersu Uzala, a film he did in Russia.? Hi Frank! I am glad you enjoyed the interview. Dersu Uzala was hard going when I first saw it in my teen years, but I'm quite fond of it nowadays. Throne of Blood is still my favourite though! I love how some of the films are being remastered and cleaned up for blu-ray. Alberti's Windwow is one of my very favorite blogs. What a great interview! Heidenkind brings up an interesting question about PhD programs in the 21st century. I think it would be really great if PhD programs involved collaboration of top scholars from lots of different universities. For example, if someone wanted to study a certain dynasty in Egyptian art, their program could provide collaboration with the top scholars in that field, regardless of location. With technology, I don't think this would be a problem (unless, er, there was a language barrier between the teacher and student). Then, PhD candidates could study with several scholars from their particular field of study, instead of being limited to just one or two field experts/advisors at a particular university. Do you have any thoughts on the matter yourself, heidenkind? After all, you're in the throes of a program yourself. I, for one, as a non-art-historian, am grateful for blogs that make art history accessible to the layperson. A great interview which has inspired me to check out her blog as well! Cheers for the wonderful feedback 'e' and Vicky! @Vicky - I am pleased you will be visiting Monica at Alberti's Window - you'll love it! Wonderful interview, it's nice to know more about Monica from a behind-the-scenes point of view. I also want to take a shot at Heidenkind's question. And I'd expand it beyond art history phd programs to humanities in the university in general. Although H asks what "will" it look like, and I think we all want to answer what we think it "should" look like!! Sadly i fear it WILL look just the way it does now. Administrators have got to start being more open to what's going on in the rest of the world and adjust programs and the way material is taught accordingly. If blogging and facebook are what kids are into right now, we have to embrace it in order to reach them, but not stoop down to being riduculous (monica in fact does a great job at this). I am not a fan of tweet walls in the classroom, but I have tried to engage students through digital media (and sadly failed - they are a lot less tech-savvy than we older folks are). As for the placement program, Monica, wouldn't that be nice!! But failing that, I wish that graduate programs or job advising centers would help people realize what skills they do have that can be applied outside academia (failing that, read the Chronicle of Higher ed column on this). Because when there are not enough jobs to go around - and it's not going to improve, we can be sure of that - we need to look elsewhere. It is entirely possible to be fullfilled in another career in which one may find in fact greater success and respect than in the university. Thank you for sharing that - it indeed highlights the stark realities of some of the problems faced. Job stability and security was the number one concern that prevented me pursuing a career in the field. I must admit that I have not regretted this decision. I'm also looking forward to what our next featured blogger will have to say on this issue. Well, Monica, I'm glad you asked! ;) I see a trend where universities center their PhD programs on one specific subject and hang the rep of the program on one renowned scholar in that subject. All of the new PhD art history programs I've heard about are doing this. I think the catch-all grad program where you have "star" scholars in every subject is kind of falling by the wayside. It would be great if there could be an internet consortium of art historians who can teach and learn via the internet, but you're forgetting these are ART HISTORIANS we're talking about. One of my profs still can't figure out how to turn on the projector. And I had to help another grad student start rotate an image on his computer the other day, so it's not just old art historians, either. So I'm not sure the chances for that are too good. This question was actually prompted by something I read on the art history newsletter about how there are no world-class art history PhD programs left. It made me wonder how one defines a world-class program, and how can we create one for the next century?